You and your child will embark on a journey through the Medieval Era this year. Using Story of the World Volume 2 as your spine, you will learn about knights and castles, the rise of Islam in the Middle East, the Crusades, Vikings, battles and more! Snuggle up on the couch and enjoy great literature that your whole family will enjoy. Find out what life in a castle was like in Castle Diary, go on a quest to find the Old Man in the Moon with Minli and see how she changes her family’s fortune in Where the Mountain Meets the Moon, and find out how an orphan boy fares when he tries to steal Hamlet from Shakespeare in The Shakespeare Stealer. The science focus this year is Earth and Space. You will spend the first half of the year learning about space using the DK First Space Encyclopedia, and the second half of the year learning about geography and the planet Earth using the DK First Earth Encyclopedia and The Geography Book. You will study the planets and complete a research page for each; learn what it’s like to be an astronaut; study volcanoes and earthquakes and learn about maps while making several of your own and so much more. You and your child will explore great artists and art techniques using Discovering Great Artists, The Children’s Interactive Story of Art and Why is Art Full of Naked People? as your guides. Your child will create masterpieces just like the artists that lived during the Middle ages through the Renaissance. These books will be used throughout the rest of the elementary years. 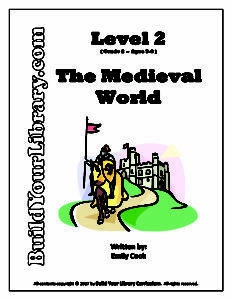 Have you already purchased Level 2 – The Medieval World? We would love to hear what you think and share your experience with others – Please feel free to leave a product review on the Contact Us page! Thanks for your support!